You can sprout all year long! It’s fun to do and they’re delicious and very healthy! Perfect for the New Year. Sprouts: An Instant Garden in Your Home! Sprouting is simple. All you need is a glass jar and a mesh lid or piece of cheesecloth and a rubber band. Place your seeds in the jar, generally a quart size, cover with pure non-chlorinated water to double or triple the height of the seeds, and soak for eight to ten hours or overnight. Place a fine-mesh lid on the jar, or use a piece of cheesecloth (something that will allow the water to drain, but not the seeds) secured with a rubber band, and drain out the water. Keep the jar out of direct sunlight and rinse at least twice a day. The sprouts will increase several times over in volume. We like to eat most sprouts within the first two to three days, although sprouted greens like sunflower sprouts or the new “micro” greens may take a couple days longer. Some of these green sprouts are grown in trays of soil that are 1–2 inches deep. Legumes and nuts do better in a jar. These are all edible once they sprout little tails around day two. Add the green sprouts to sandwiches and wraps, and the legume sprouts to salads and stir-fries. Add sprouts to your favorite sandwich spread or chopped in deviled eggs. 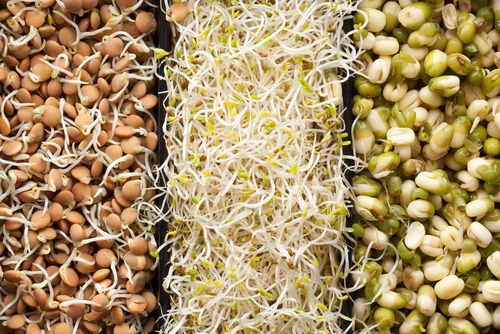 Lentil sprouts are a wonderful addition to rice dishes, while onion or radish sprouts are great in coleslaw or potato salad. Try puréeing your favorite sprouts and topping your vegetables with the purée. Experiment! Sam Jones Shelter and 52 Ways It’s Cabbage Season!